It was a perfect day - not too windy, not too hot, not rainy, just right. There were stalls and kids and produce and preserves and dancing and music and good home made tucker. Best of all, there were lots of people connecting with each other, and networking about all sorts of sustainable living type stuff. 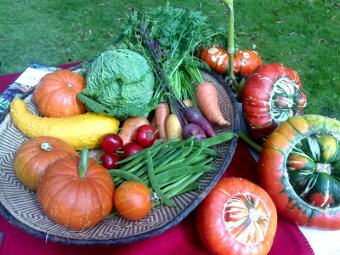 Christina took along some produce from the garden - its a colourful time of year for harvesting. The turks turban pumpkins attracted plenty of admirers. The rhubarb and vanilla bean jam was so popular we're putting the recipe on our recipe page. Its easy and delicious. Check it out!